Hey everyonee, yay so a few days ago I got the most exciting parcel that i've ever had through the post. I literally was SO excited when my Mum dropped this off for me at my new flat. Wowoww. I was like a child at Christmas and I still am every time I look at it. I was lucky enough to get my first ever JOLIEBOX! 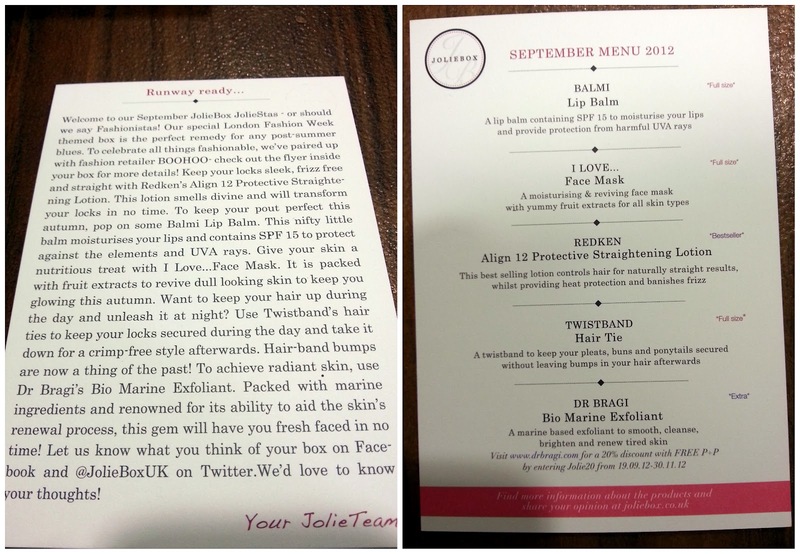 I love the personalised message that you get with the box, I love the fact that it is signed 'Your Jolie team.' This tiny detail just makes the whole box really personal and gives it an intimate and friendly feel. This is a special London Fashion Week box which got me even more excited. As you can see, inside the box is a beautiful draw string bag. It really is high class. I will definitely be using it for carrying my toiletries around or simply to protect things/stop things from leaking in my bag. It's very easy to just chuck in your bag yet it looks so on trend. I am really impressed with this. As you can see, also included was a JolieMag which also impressed me as I didn't expect a magazine with my box! I also got Boohoo's latest lookbook, including a special 20% off code. And as if that didn't impress me enough (I only expected some samples in a box!) I also got a £25.00 voucher for SKIN3 salon. I cannot wait to use this, I think I am going to treat myself to a guilt free massage as i've never had one. How generous of Joliebox! AND, I read the magazine last night and thoroughly enjoyed every page, however, it has given me so many more products to put on my wish list, but what I loved best about JolieMag is the fact that there is a dedicated bloggers section at the end, where they interview a blogger. I am making it my goal to be interviewed by Joliebox in a few years time, watch out Joliebox team! Sooo... the products; on first glance I was like 'oooooooeeeee!' as I was soo excited. 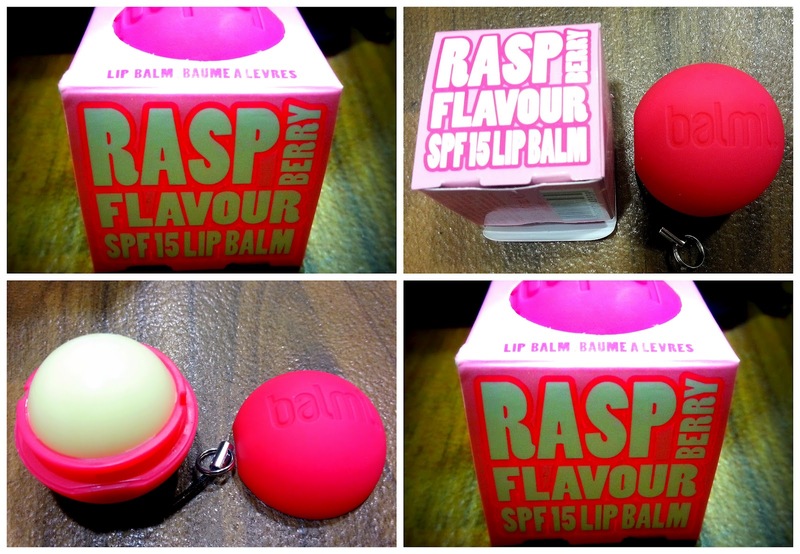 Look how amazing this yummy rasperry lip balm is?! I've never seen ANYTHING like it. It's made by a brand i've never heard of 'Balmi' but I want to purchase more stuff from them after seeing this cool lipbalm, I think it would make a great gift. Not to mention the fact that it tastes and smells delicious. Hooray to yummy lipcare. RRP: at boots this is £4.99. Not bad to think that it came in our Joliebox which only cost a tiny bit more than this plus, it is sooo cute and playful. 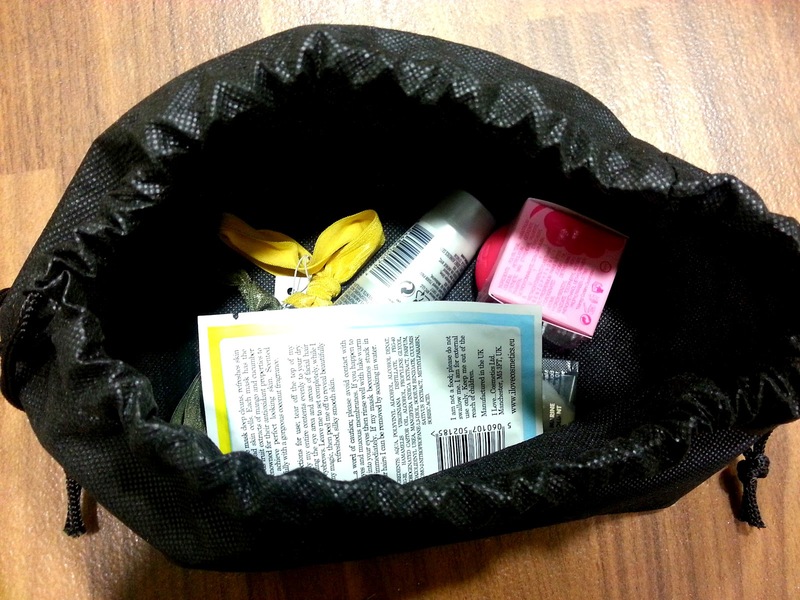 It's gonna look so pretty and funky in my make up bag. The next few products are just as exciting. First I would like to draw your attention to the photograph below, in the far right hand corner. This product is one that you'd look at and be dissapointed, probably think, it's tiny I don't get it? But use it and you will see why it is included. I deliberately left this post a few days to publish because I wanted to actually try the products out. I am so glad I did because I cannot explain how good this is. It is by Dr Bragi and whilst I have never heard of him before, I now want his whole collection after this. It is a bio marine exfoliant which is actually manifactured in Iceland. If that mouthful doesn't sound good enough, it is 'packed with fossilised diatom algage' and is a '98% natural exfoliant' which elimates dead skin cells AND works on deeper layers of the skin. My skin did feel instantly brightened and renewed after the first use, and you only need to use the tiniest bit! It's only £25.00 for a full sized version which really isn't too bad considering how good it is and how little you'll use each time, I think I will be putting this on my Christmas list as I'd love it to be a regular part of my skin care routine. I also got Redken's protective straightening lotion. This of course is always going to come in use for me as I need hair products all the time. I put this on tonight and did find that my hair dried a lot better than it usually does, it just took the kinks out of my hair. The tube is 30ml which is quite big and will last me a long time. This product is available from around £15.00 which means that for a 30ml sample it is worth quite a few pounds. I've only ever heard good things about Redken so I can't wait to continue to use this product. 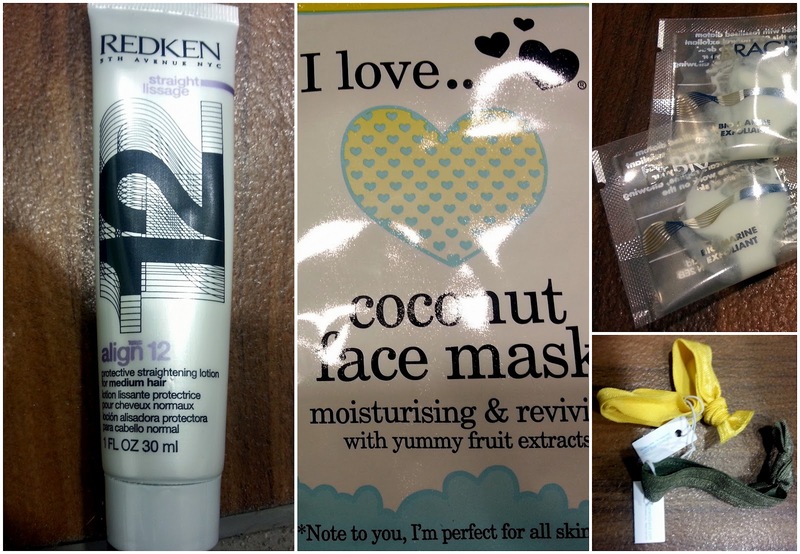 I also recieved an 'I love... coconut face mask' which has fruit extracts and is perfect for all skin types. This made me excited because most facepacks draw out your spots and really aren't good for many skin types! I am yet to use this but I will be in touch when I have. I really have got into facepacks recently so fingers crossed this will be just as good as some others that I have used. Last but not least I recieved two twistband hair ties... these are RRP: £2.99 and I do think the concept is amazing, they are designed to 'keep your pleats, buns and pony tails secured without leabing bumps in your hair afterwards' and they do actually work... I can't wait to convert from bobbles to these full time. 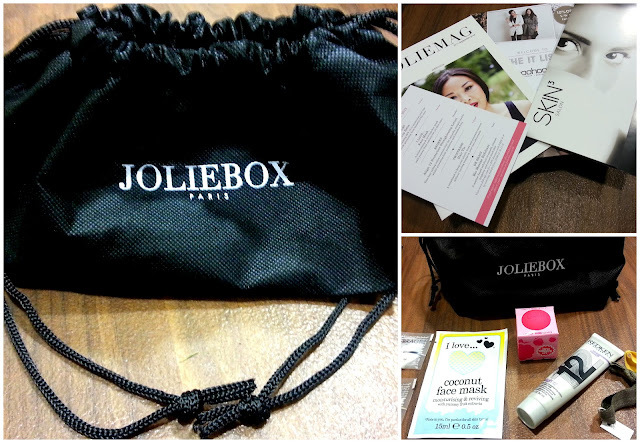 I was impressed with my first ever Joliebox and can't wait for my next one. I think it's well worth the £10.00 and I am now converted. 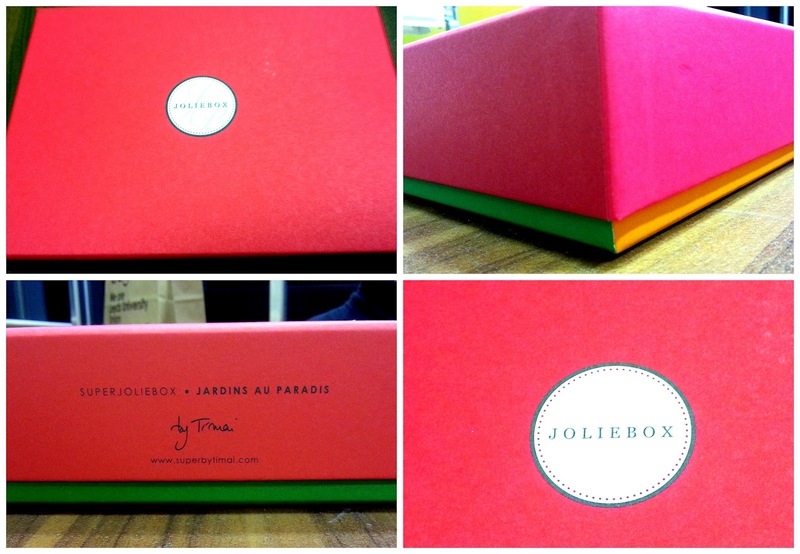 Here's to more Jolieboxes! This one is available til September 30th if you still want to get your hands on it. Do you use Joliebox? What's your fave beauty box? You got a lot of really great stuff! Glad you liked your jolie box! I'm in envy! Everything looks incredible. I'm the same way though. I'm subscribed with Glossybox right now but I know once I unsubscribe, I'll miss having a box every month. The dilemma! But man, I need to find myself some of those twistband hair ties! Enjoy trying out your new things! Love this! I really need to subscribe to one of these beauty boxes. They look fab. Check out my beauty blog as well, I'm always looking for new followers! Looks like you got some amazing stuff!! !